If you love to fish, you should know how important it is to take proper care of your fishing rod. 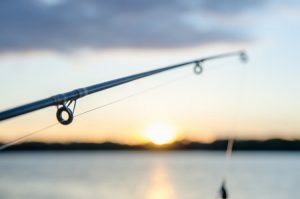 If treated well, your rod can reel in catches for seasons to come, but many fishing enthusiasts take their rods for granted and don’t clean and store them the way they should. Read on for a few tips for properly taking care of your fishing rod. Cleaning your rod effectively is the most important thing you can do to prolong its lifespan. Use a Q-tip and Reel Magic to clean your guides, removing any buildup from minerals, grass or other vegetation. Then, use a towel soaked in rubbing alcohol to clean the handles and reel mounting hardware. How you transport your fishing rod and how you handle it while you’re fishing will make a huge difference. When you’re driving to your fishing destination, make sure your rod isn’t coming into contact with any hard surface or another rod. While you fish, never place your rod on the ground – use a bank rod holder instead. Always store rods vertically. Never lean them against a wall or piece of furniture, which will cause them to warp. Invest in a good rack system to keep your rods safely off the floor. Fishing enthusiasts in the know come to Mattice Lake Outfitters for abundant fishing opportunities and a relaxing stay at our fully furnished wilderness lodges and outpost camps. Located in stunning northwestern Ontario, we’re a fly-in fisherman’s oasis. Give us a call today at 1-800-411-0334 to book the fishing trip of your dreams!